Pope Francis is greeted by a child upon arrival in Yangon, Myanmar, on 27 November. Pope Francis landed in Myanmar today (27 November) to start his six-day visit to Southeast Asia, raising the hopes of Christians there that he will address the issues they face in the majority-Buddhist nation. John Hong Khong, from Kachin, told UCAN they expected “to get peace through the Pope’s visit as we believe he will raise peace issues and push the country’s leaders for ending ethnic conflicts”. Leading up to the visit, Myanmar’s Catholic Cardinal Bo said he hoped Pope Francis’ trip would “help heal the wounds of his country, especially for minorities under attack”, adding that the “Rohingya situation is a great tragedy [but] the country needs healing on various fronts”. During his three days in Myanmar, the Pope will visit the current and former capitals, Nay Pyi Taw and Yangon, and meet, among others, the country’s leader – in all but title – Aung San Suu Kyi. The Nobel Prize winner has come under pressure in recent months because of her handling of the Rohingya crisis. Since August more than 600,000 people belonging to the Rohingya Muslim minority have fled into neighbouring Bangladesh following attacks by the army which, according to the UN, amount to “ethnic cleansing”. The Pope is also due to visit Muslim-majority Bangladesh during this trip. It is expected he will address the plight of the Rohingya, with some fearing that this might lead to repercussions for Myanmar’s Christians. During a visit to the UK parliament in 2016, Cardinal Bo said: “The majority of the Kachin, Chin … and a significant proportion of the Karen, are Christians – and over the decades of armed conflict, the military has turned religion into a tool of oppression. 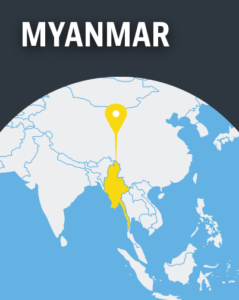 Around one sixth of Myanmar’s Christians, who altogether account for around 6 per cent of the population, are Catholics. According to Rev. Mariano Soe Naing, a spokesman for Myanmar’s Bishops’ Conference, “there are always challenges to stand up as Catholic and to have strong faith here”, and pressure comes in many different forms. An example is the extremist Buddhist movement called “Ma Ba Tha” (Committee for the Protection of Race and Religion) which – so far – has mostly targeted Muslim groups in the country through hate speech, but this “has a knock-on effect on Christians as well”, Rogers says. A census, conducted in 2014, showed a rise in the number of Christians (6.2 per cent from 4.9 per cent in 1983) and a fall in the popularity of Buddhism, although 88 per cent still identified with the country’s most popular religion.